From food safety to transportation or temperature control, ingenious packaging has been conceptualized to meet emerging needs. At Foodélice, we tend to be innovative thinkers developing clever, useful and appealing packages for our manufacturers in order to offer quality trend setting products that can help their clients’ bottom line. 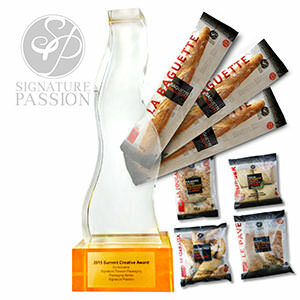 Foodélice, Signature Passion and partnering design agency, Symbiosens, were thrilled to receive this year’s Gold Award at the Summit International Awards (SIA) in the Packaging Series category for the innovative and unique packaging solution they jointly developed for Signature Passion. In addition to the winning design, with this new and attractive “warm it with the bag” packaging, Signature Passion has succeeded in doubling its sales. Over the past 21 years, the Summit International Awards organization has been awarding the best in creativity. With more than 5,000 submissions from 23 countries this year, Foodélice and Symbiosens’ creativity came out on top against the finest worldwide. Our winning entry is an oven-ready bag that allows retail clients to pop the artisan bread in the oven without removing the packaging. This contemporary packaging simplifies preparation, reduces operation cost, facilitates kosher and peanut-free products certification, and eliminates the risk of product shrinkage, resulting in a significant increase in sales through mass merchandising. For more information on our winning Take & Bake solution, click here.